I'm thinking of getting an iPhone in the next few months (probably after the next version is released, now said to be in June or July). 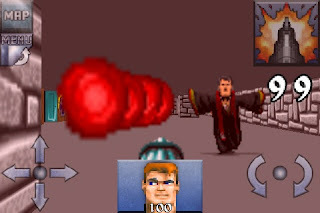 If/when that happens, id Software's classic Wolfenstein 3D might be the first thing that I buy from the iPhone App Store. You can now take B.J. Blazkowicz's one-man war against the Nazis with you anywhere. Kotaku reports that the iPhone version is "better" than the original. Some of the coding for this port was done by id's John Carmack, who is now also saying that Doom will be coming "fairly soon" for the iPhone as well.